This was our second year attending the largest Ag-Genomics meeting in the world in San Diego CA. 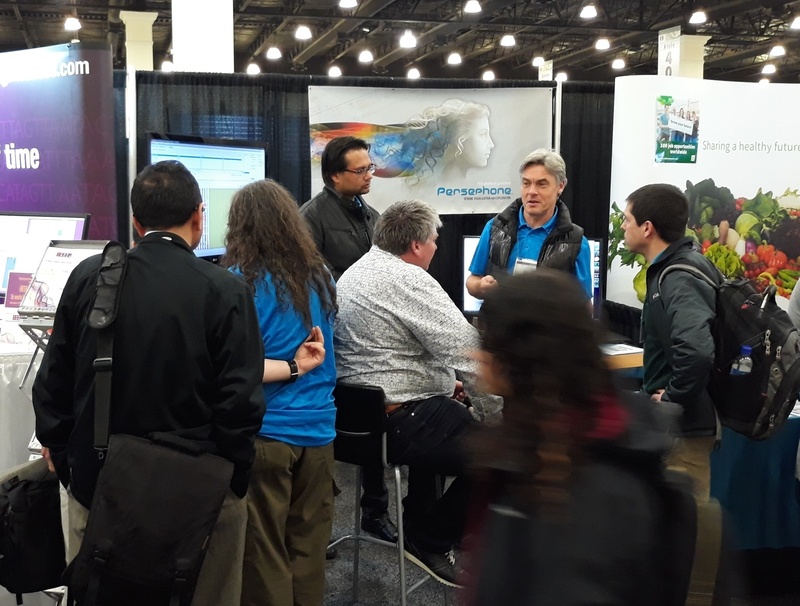 Many thanks to all who stopped by our exhibit as well as those who attended Max Troukhan’s talk at the IWGSC workshop (https://pag.confex.com/pag/xxvii/meetingapp.cgi/Paper/36359) where he demonstrated the wheat genome data visualized in Persephone. We had a steady stream of visitors to our booth all of whom had sincere interest in our product. The interactions that we had will definitely play a role in shaping our product in the future. Some of the highlights of this year’s exhibit were our newly added features and enhancements to both Web and Desktop versions of Persephone. The Web version, which is freely available at: https://web.persephonesoft.com has now a few new features, such as the ability to edit mapset tree, displaying quantitative tracks for the entire chromosomes, inverting maps, etc. By popular demand, we are planning to add new things like a module that will allow users to visualize their data displayed alongside the tracks from the database. Please bookmark us and visit us regularly for updates. We have also uploaded the wheat genome data to show off capabilities of Persephone to deal with large data sets in the web browser version. We already have other data sets such as human, rice, sorghum or corn loaded for public view. If you have your favorite genome, please let us know, and we will try to add it. Our Windows desktop version saw a number of enhancements as well. This include interactive dot plots, selecting subsequences based on detailed exon structure, handling indels and effect of variants on translation, and so on. If you would like to try our free desktop version that shows public data, you can download it from here: https://persephonesoft.com/clickonce/Persephone.application. Please consult https://persephonesoft.com/installation/ for installation steps. If you need help, please let us know. We continue to work hard to serve our customers and come up with new ways to better visualize genomic data. You all are a big part of this process, so thank you again for supporting us. We are looking forward to see you again next year in beautiful San Diego CA. Professor Rudi Appels asks questions about ways of loading the wheat data into Persephone database. Max Troukhan presents various types of tracks with the wheat data loaded to Persephone.